A passion for recreation is what brings many people to Bend. Located in the high desert of central Oregon, Bend is famous for its many forms of outdoor recreation. Bend, Oregon is located on the banks of the Upper Deschutes River, which was originally named "river of falls". The desert climate provides clear, sunny days and cool comfortable nights. For recreation, there are many choices. World class climbing routes and mile upon mile of beautiful hiking trails are to be found on nearby Smith Rocks, Skiing on Mt. Bachelor with over 3000 skiable acres, mountain biking, camping and rafting are just some of the attractions in this outdoor sport mecca. The Deschutes, Metolius and Crooked Rivers offer great fly fishing, with more than 500 miles of streams and rivers stocked with trout and steelhead. For golfers, there are 20 top-rated courses nearby to choose from. Snowmobilers have 560 miles of trails to choose from in the Deschutes National Forest. And don't forget the Three Sisters Wilderness for hiking and camping expeditions. One of the best local views can be found at the Newberry National Volcanic Monument. The monument stretches from Paulina Peak to the Deschutes River and includes hiking trails, lava formations, obsidian fields, and many waterfalls. Also in the monument area is the 18 square mile Newberry Crater, which has two lakes, Paulina and East. These lakes provide some of Oregon's best mountain fishing lakes. More restful days can be spent exploring Bends several shopping malls and specialty shops. For the Arts, Bend also has the Obsidian Opera Company, and a "Munch and Music" concert series during summer. A trip to the High Desert Museum is a great way to spend an afternoon. 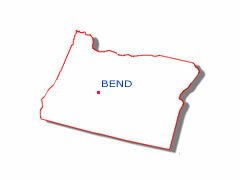 At the museum you'll find masses of exhibits on the culture, history and wildlife of the Bend area.